A cross-section of a Concord berry at 30 days post-bloom. 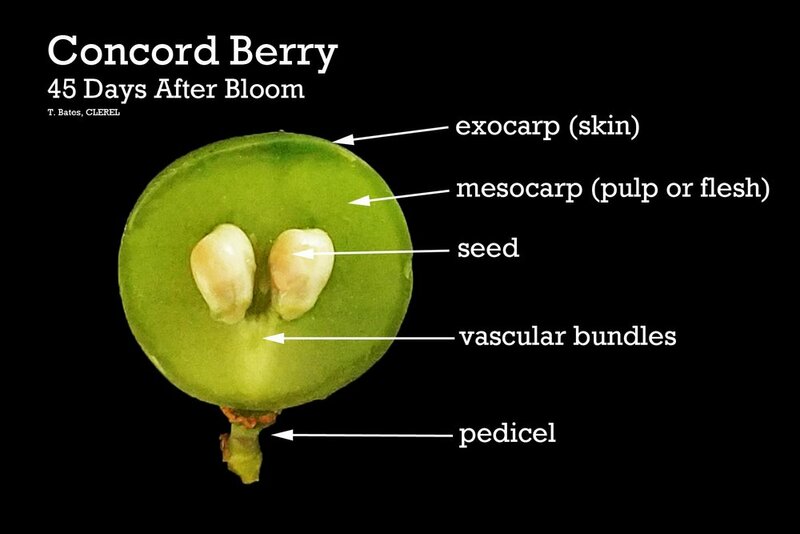 In addition to seed development, the cell division and expansion of the mesocarp tissue has a considerable influence on fresh berry weight. Cell number will double two times during stage I through cell division. In addition, cell volume will increase through cell wall loosening and the expansion of cell vacuole volume. Presumably, the cell division hormone, cytokinin, diminishes through stage I, which slows cell division as the berries enter the lag phase of berry growth (stage II). At 45 days after bloom, Concord berries are between 60-65% final fresh weight and are entering stage II of berry development. This stage is also referred to as the lag phase and will last until veraison (approximately 69 days after bloom in Lake Erie Concord). Lag phase is dominated by seed development and maturation. By veraison, the seeds will reach their final size and lignify in preparation for dispersal. The growth of the mesocarp and exocarp slows during the lag phase. Again, it is the balance of plant hormones, such as auxin, cytokinin, and abscisic acid, which controls the cell division and expansion in berry tissues and prevents the seeds from germinating too early.